Visit Us M-F 6:30-5, Sat. 7-3 150 E. Orangethorpe Ave. Composed of multiple layers of quality synthetic material that are fused together, laminate flooring is extremely durable, topical moisture resistant, and easy to clean. Laminate's synthetic makeup gives you flooring that can often withstand impact from furniture, high heels, cigarettes, common spills, chemicals, and extensive wear and tear. Laminate flooring even resists fading from sunlight and doesn't require waxing or other maintenance coatings to retain its look. Its special man-made attributes also make it more resilient, so it requires minimal subfloor preparation and less-costly underlayment during installation. While laminate flooring can look remarkably similar to expensive hardwood, stone or tile, it can be purchased for approximately one third or half the cost. For all these reasons and more, laminate flooring is growing increasingly popular among Orange County property owners looking for an affordable alternative to solid wood, engineered wood, stone, and tile flooring. At Fullerton Paint & Flooring, we are proud to offer laminate flooring from national brands, such as QuickStep and Mannington. Such brands give our customers quality laminate flooring at a very competitive price. 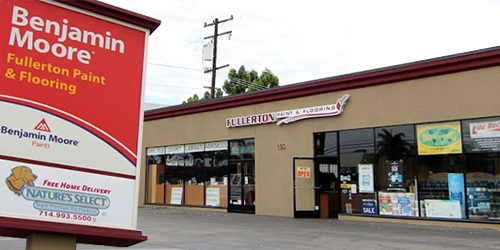 Stop by our Anaheim showroom to explore our laminate flooring options. We have laminate flooring available in a full spectrum of colors, styles and designs.